A year ago, my friend Amy and I were on the road. During the tail end of a rare Texas sleet and freezing rain event. Heading to Austin, Texas, for this thing called the IF Gathering. We weren't sure. It was all rather foggy and unclear. But we knew we wanted to go. So, like rabid fans of some rock band, we sat at our computers at the appointed time when tickets went on sale, months prior to the event. Feverishly, we made attempt after attempt to access the overloaded website, texting each other in the meantime, as well as texting some other friends in the same predicament. It was a frenzied mess. SCORE! We somehow managed to be part of the 1200 tickets that sold out in 45 minutes. For an event no one was completely clear on how to describe or what to expect. We giggled along with the others gathered there in Austin when the introductory announcement was made and the leadership team admitted they weren't exactly sure either how to describe it or what to expect, but they were happy we had all taken the leap of faith with them. I'd say it's like a women's event, akin to Women of Faith. But it's not. It was far more intimate, by design. Smaller gatherings. There live in person and among the thousands of simulcasts concurrently happening around the world. Women gathered. Eager for fresh words and encouragement from God. Ready and game for whatever the two days held. I've gone to many the Bible study and a couple of women's retreat. The IF Gathering is unlike any of them. Oh, there was powerful worship and incredible speaker after speaker. There was time to discuss and have conversation with the women around us during the sessions. It has all the elements of a typical women's retreat. Because it was women of all ages, from all denominations, from all backgrounds, from all over. Gathered for what? We weren't sure. But just gathered in the name of Jesus, starving for something more. Hungry to be satisfied. Not with religion. Or piety. Or a task list of ways to be a better woman, mother, wife, or Christian. Hungry to be satisfied with something more. Something of substance. Something that would break our tired old habits and rituals. It was not what I expected. It was more. It was profound. It was so meaty and freeing that I am still pondering all that I heard. And today, the second annual IF Gathering occurs. Today, thousands of women in countries all over the globe are gathering. In homes, in churches, in whatever space they can find. Yes, a couple thousand will be in Austin, to experience it there in person. But, this year, I deliberately chose to be part of the IF Gathering Local. Which means we created a Facebook event, invited everyone we could think of, and are praying that the livestream simulcast works perfectly, there in the beautiful living room of my friend Haley. And I cannot wait. I've had butterflies in my stomach for days. I'm not nervous about hosting this event. I'm just anticipating. I'm on the edge of my seat with a knowledge that I did not have last year. 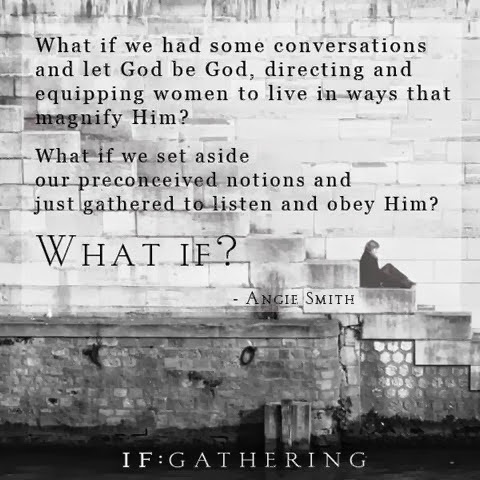 A knowledge that when women of all denominations, from all sorts of walks of life, dare to gather to listen to whatever God has to tell them, he shows up and he speaks loudly and boldly. And it is nearly indescribable. Last night, at the simulcast testing, my co-host and I heard the introductory statement from Jennie Allen, the event's founder. It gave me chills. She spoke of God's epic story throughout all of history. And how we all long to be part of it. Somehow. We all have a hunger for something more, for significance, for meaning, for satisfaction, for purpose. And God is eager to reveal what our part in his story is. In his story. In history. We all have a part. We are all invited by the Almighty God to participate in how he dares to cause heaven to intersect with earth. All the ways he reveals himself. Constantly. Continually. All the ways he longs to use our gifts and our talents and our times to do more. To be part of the work of the kingdom. It's not too late. To be part of the IF Gathering this weekend. Hop on their website and look for a local gathering near you. Or sign up for the livestream into your own home. Or message me and join us, here in the DFW area. And if this weekend isn't good, then you can buy the digital download of the event and watch it later. I cannot encourage you strongly enough to participate. To take a step of faith and dare to ask yourself. If God is real, then what? Then what does that mean for me? How will that impact my life? And this year, we will discover some truths behind this question. If God's promises and His word are true, then what? What if we really took him at his word? What if we really believed every word of the Bible?